The ocean is 95 percent unexplored, unknown, and unseen by human eyes. Resource managers cannot manage what they do not know. To understand, manage, and protect the ocean and its resources, NOAA believes it is critical to support a systematic program of ocean exploration, using the best of ocean technology to explore, discover, inform, educate, and motivate. Exploration of our largely unknown ocean supports key NOAA, national, and international goals related to a better understanding of the ocean that will benefit current and future generations. From May 8 – June 12, 2015, the NOAA Ship Okeanos Explorer is helping us to better understand the unknown ocean by collecting continuous ocean exploration data during a long journey across the Caribbean Sea and eastern Pacific, traveling from San Juan, Puerto Rico, through the Panama Canal and on to Pearl Harbor, Hawaii. One of the primary purposes for this expedition is to move the Okeanos Explorer from the U.S. east coast to Hawaii. Fortunately, we are able to conduct exploratory mapping and incorporate some interesting exploration objectives into the nearly 7,000-nautical-mile journey. Proposed track lines for the ship during this expedition. Leg I is in the Caribbean Sea between San Juan, Puerto Rico and Panama City, Panama. 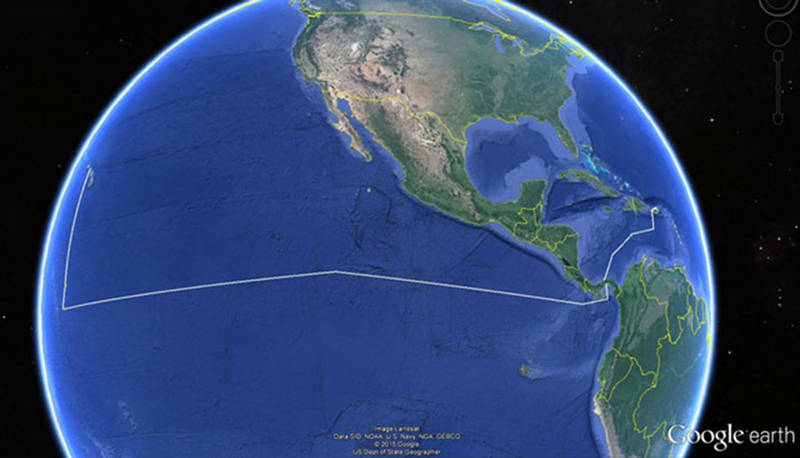 Leg II is in the eastern Pacific Ocean between Panama City, Panama and Pearl Harbor, Hawaii, along the Clipperton Fracture Zone. Image courtesy of Google Earth. Download image (jpg, 47 KB). During the expedition from Panama to Hawaii, a portion of the Clipperton Fracture Zone will be mapped using multibeam sonar. The Clipperton Fracture Zone feature was identified as a priority feature to map during a 2014 Ocean Exploration Trust Eastern Pacific Planning Workshop. Submarine fracture zones generally occur around seafloor ridges associated with active plate boundaries. Mid-ocean ridges form at divergent boundaries where two tectonic plates are moving apart. As plates on either side of a mid-ocean ridge move, transform faults are created. As the plates continue to move, these faults eventually will offset the mid-ocean ridge, and can cause fractures in the ocean floor. These fracture zones can be hundreds of kilometers long. There is increasing recognition that fracture zones can be sites of active fluid flow and, in certain cases, they can even be sites of active volcanism. As divergent tectonic plates separate and transform faults form, these faults eventually will offset the mid-ocean ridge and can cause fractures in the ocean floor. Image courtesy of Google Earth. Download image (jpg, 50 KB). The Clipperton Fracture Zone is an extensive 4,500-mile (7,240-kilometer) submarine fracture zone in the Pacific Ocean. This fracture zone is a prominent bathymetric feature extending from the East Pacific Rise thousands of kilometers westward and out to seafloor that is over 100 million years old. There is potential for detection of seeps and deposits of manganese nodules along such fracture zones. Furthermore, subtle changes in plate motion over the past 100 million years could be recorded in the detailed shape of the fracture zones, providing insight into the complex history of the huge Pacific plate. If, ultimately, scientists would like to send remotely operated vehicles (ROV) or autonomous underwater vehicles (AUV) into these fracture zones and explore for active fluid flow and/or volcanism at the seabed, it is absolutely necessary to begin with a working base-map of the region. Until further technology is developed, the only way to obtain reliable bathymetric data to plan future AUV or ROV based exploration dives is to drive a suitably equipped ship directly over-head. The work during this mapping expedition may be a first step toward addressing a completely new set of geologic processes (German, 2015). There is also growing interest in deep-sea mining in this region and the seafloor around the Clipperton fracture zone area may contain rare earth minerals. Mapping this area will allow the collection of baseline data useful in determining future use, management and protection within the region. 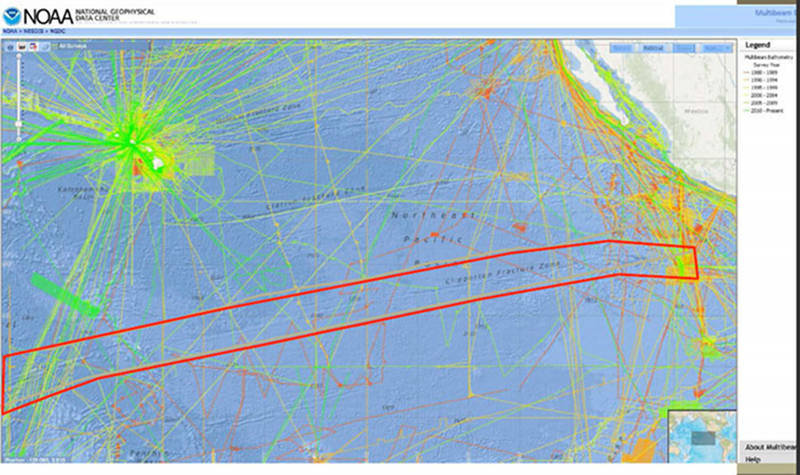 A screenshot from the NOAA-NGDC website that highlights the scarcity of multibeam data along the Clipperton fracture zone (boxed in red). Image courtesy of Marie-Helene Cormier, University of Rhode Island Graduate School of Oceanography. Download image (jpg, 94 KB). Recovering two a PICO-Prawler ocean observation moorings and deploying an instrument called a seasnake, to tow during the entire transit measuring sea surface salinity. The data collected from both of these instruments will supports climate research. Deploying a dozen ARGO floats , ARGO is a global network of more than 3,000 free-drifting ocean observation floats that measures the temperature and salinity of the upper 2000m of the ocean. Following this expedition, the ship will spend the rest of the summer exploring the waters around the Hawaiian Islands. Look for more information in late June and July.